The Credit One Bank Official NASCAR Visa (Excellent Credit) currently has an Informr score of 6.7 out of 10. This score is based on our evaluation of 1 sources including reviews from users and the web's most trusted critics. Credit One Bank Official NASCAR Visa (Excellent Credit) is typically available to those with excellent credit scores (650 or greater). 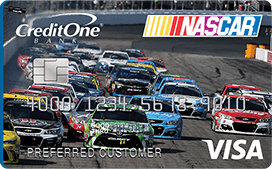 If you’re a die-hard and responsible racing fan pondering whether to apply for the Credit One Bank NASCAR Credit Card, you might want to consider shifting gears to choose a different card instead. This APR will vary with the market based on the Prime Rate. Of each transaction in U.S. dollars.